I still owe you guys my first National Plug In Day experience. However, to be a little more timely, I figure to update my Charge It! series. As many of my readers know, I’ve been writing on a series of great restaurants to go to while you charge. Today’s post is a little different. It’s nowhere to be found in the Los Angeles area. It’s in Northern New Jersey, approximately 30 minutes (with no real traffic) from New York city – Nauna’s Bella Casa. 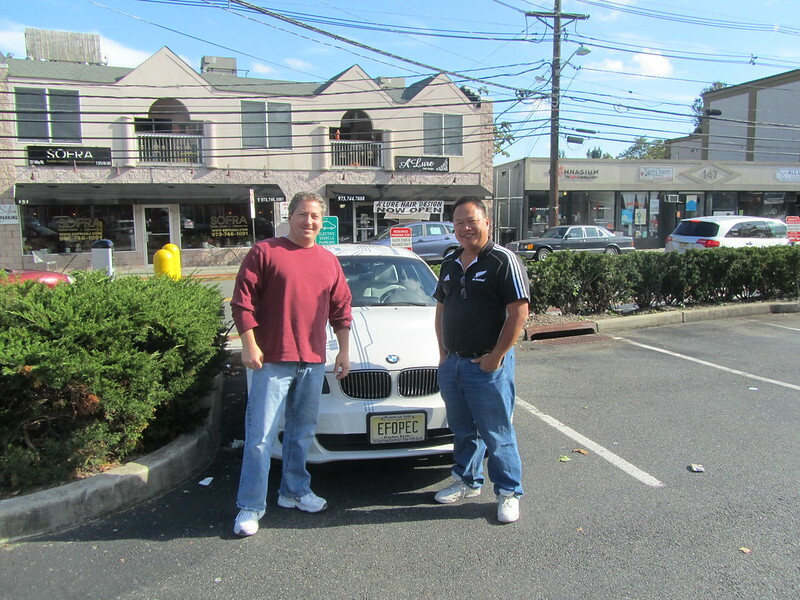 No, I didn’t take several weeks to go from Los Angeles to New Jersey to go to lunch with my ActiveE. For this trip, I rented a Nissan Leaf from Hertz on Demand. Hertz car sharing subsidiary which allows members the opportunity to rent either a Nissan Leaf or SmartEV in the New York city area. Nauna’s Bella Casa can be found at 148 Valley Road, Montclair, New Jersey, 07042. (973) 744-3232. So, what takes me from New York City to Montclair, New Jersey. Frankly, I wanted to meet this guy, Tom Moloughney, aka Mini-E #250 and more importantly to me, Mr. ActiveE #1 and the top mileage leader that I foolishly challenged to try to “catch up” on top mileage use for all of the other ActiveE Electronuts. As of the writing of this posting (in-flight from JFK to LAX) my ActiveE is waiting for me at LAX Lot 6 with 17,902 and Tom’s listed mileage on wotnogas.com is 27,795… Needless to say, this is a TOUGH challenge. Here’s a picture of Tom Moloughney and me in front of Tom’s New Jersey EF-OPEC (AKA Active E #1). So, how’s the food. It was good, home-style Italian food at a great value. I had the lunch special which was Soup, Entree, soft drink, coffee (or tea, I believe) and dessert for $9.99. As opposed to other posts in this series, I have NO picture of the food. I was too busy enjoying the discussions between Tom and myself on the Active E, EVs, new BMWs, Teslas, Energy Independence, etc. For my choice of soup, I picked the Pasta Fagioli. There were other choices, but I really like Pasta Fagioli so I had that. For my entree, I went with the Fusilli e Pollo which is the spiral pasta with grilled chicken & spinach. I really enjoyed the Fusilli e Pollo, but since I went out to Nauna’s in Day two of my trip to the East Coast, the meal was biologically breakfast for me, so the portion size was a little larger than I could finish, so I brought the rest to go. I skipped coffee and had ice cream for dessert (chocolate). The meal was very good and felt home-cooked. How about the chargers? Nauna’s has two J1772 chargers, one on Chargepoint and the other on the Blink Network. If you’re eating here, the charging is gratis, otherwise, the network fees would apply, I believe that the Chargepoint is free, but the Blink is based on your membership plan, so to get that charging at no cost, check in with the restaurant before you plug in. How did I do getting to Nauna’s. Well, I picked up the Nissan Leaf (was hoping for a SmartEV, but that will have to be a different post) from Hertz On Demand’s location at 375 Hudson Street, New York, NY 10014. This drive was approximately 20 miles away, but my consumption is closer to 35 miles from the range. This was my first time driving a Leaf for ANY extended period and I must say that it was not as fun as my Active E, at least it seemed to perform better than the Coda that I test drove a few months ago. So, if you find yourself anywhere near Montclair, NJ. Even if it isn’t that near, give Tom a call and see if he’s available and you can enjoy a tasty lunch and have some fun “talking EV and stuff”. I’ll probably get around to plug in day 2012 (Part 1, Part 2 to follow) and my Hertz on Demand SmartEV rental fiasco. It was great to finally meet you in person Dennis and thank you for the kind words here. That being said, just because we’ve met don’t expect me to let up on you with regards to the mileage race. You better get to 20K before I hit 30K or it’s all over for you! As I’ve said before… It’s great to have someone like you, Tom, out there to challenge the rest of us to try to catch up… I figure to get to 20k soon! I just have to stay in the LA area for that, and that’s the tough part. I think you need to go on ANOTHER vacation… You work too hard, take a break. The Fall is an inexpensive time to visit the rest of Europe! Next Next post: Hey my ActiveE hit a palindromic milestone!